Ok this post might reveal some crazy OCD or just weird-isms about myself. I am a huge fan of yellow polish! And huge is an understatement! Yellow is by far my favorite color to wear in the summer and I go through an entire bottle of yellow polish every summer. I have been the same way since I started painting my nails. But I won’t touch yellow polishes any other time except for the summer months. I don’t know why I save it for the summer because its such a cheery, bright color and it would be nice in the spring or any other season to cheer me up. But in my weirdness I will only let myself wear it in the summer and I start to crave wearing yellow around mid-spring. I have been wanting to wear yellow for the longest and I finally let myself put on a yellow color for my last final. Needless to say, I didn’t take it off for 3 days and am now wearing another yellow polish. I have opened the floodgates and I have now opened the floodgates for a huge influx of yellow manicures. This came in my Zoya Earth Day order so it was only appropriate that I wear it first. Zoya “Creamy” is the unknown Zoya yellow polish. Everyone talks about “Pippa” and claims that it is one of the best yellow polishes. 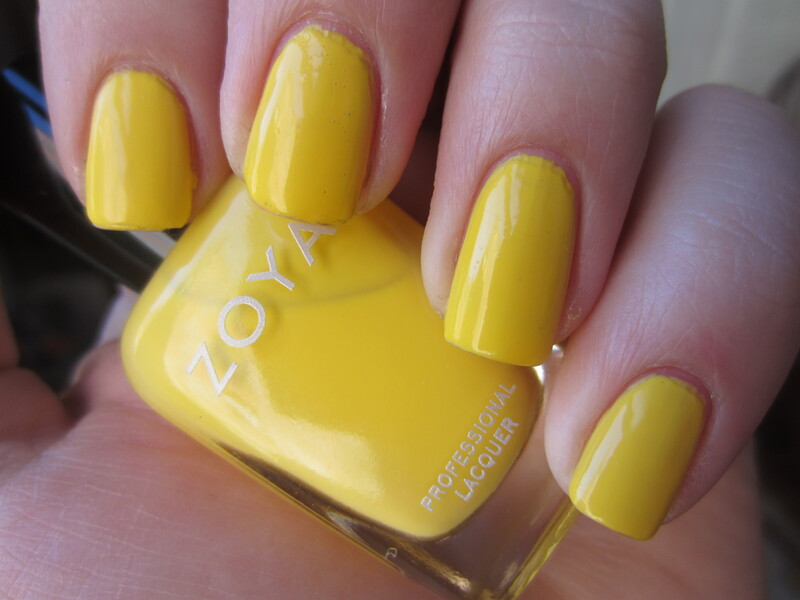 I don’t own Pippa but I tend to favor yellow pastels more than traffic light yellow, so when I saw that Zoya had 2 yellow polishes and one was lighter, I was all over that. “Creamy” to me is amazing but almost too bright, and if I think this is too bright I wonder how Pippa would be on me. This is 3 coats and was an amazing application. One thing about yellow is that they are a nightmare to apply and normally are a streaky mess. This needed 3 coats but evened out nicely and took a good 3 days to chip. No complaints about the formula but I expected the color to be more of a pastel. Are any of you like me, where you have a signature color in a season and won’t let yourself wear it any other time? Or am I the only crazy one who refuses to wear certain colors if it isn’t a certain season? And do any of you have Pippa and how does it compare to this? I have Pippa… The coverage is good, but I think I might have a bad bottle because mine is super thick and goopy! I haven’t tried thinning it yet, but think it will be fine once I do. I have worn Pippa and I got a ton of compliments on it! I don’t like to wear pinks in the winter! It just feels so weird, no matter what the shade! So I understand what you mean! 🙂 I’ve also only worn a yellow polish once, but this makes me want to try it again! I have Pippa but haven’t worn it yet. I agree with you, though – yellows are notoriously evil when it comes to application! I don’t have this shade, but it looks so pretty… I may have to cave and get it. I love yellow polish too!